Online video catch up and rental service SeeSaw is offering the chance for fans to vote for the entire second series of Doctor Who to be made available to rent for only 99p. 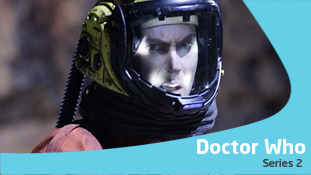 David Tennant's first season as The Doctor is in competition with Lost, Life on Mars and Only Fools & Horses. The show with the most Facebook 'Likes' by Monday 22nd November at 9am will be available to rent on the Tuesday after for 99p. You will then have up to 90 days to watch the series. To cast your vote head over to SeeSaw's Tight Tuesday page. icWales reports that Doctor Who and its BBC Three spin-off seriesTorchwood have between them earned 21 nominations at the BAFTA Cymru Awards. The awards, given by the Welsh branch of the British Academy of Film and Television Arts, celebrate achievements by film and television productions produced in Wales. Doctor Who won the Best Drama Series category at the same ceremony last year, where the show also won several other categories including Best Director and an Oustanding Contribution to Network Television Award was given to Russell T Davies. This year, both Doctor Who and Torchwood are nominated in the Drama Series category, with David Tennant andJohn Barrowman nominated for the Best Actor award and Billie Piper and Eve Myles both in the running in the Best Actress category. The winners will be announced at a ceremony in Cardiff later this month. The Stage and Paul Cornell are reporting the nominations for the Hugo Awards 2007. Doctor Who is nominated three times in the "Best Dramatic Presentation, Short Form" category, which the programme won last year with The Empty Child/The Doctor Dances. This year, the episodes nominated are Army of Ghosts/Doomsday, The Girl in the Fireplace and School Reunion. The other two nominations in this category are episodes of Battlestar Galactica and Stargate SG-1. Last year's series of Doctor Who has been nominated twice in the Bafta Television Craft Awards. Crispin Green is up for an honour in the Editing: Fiction/Entertainment category, while The Mill has been put forward for recognition in the Visual Effects section. The winners will be announced at a ceremony at The Dorchester hotel in London on April 22. Last year, the show was nominated for four craft awards but didn't win any, although Mike Tucker, who was in charge of the model effects, was in the team that scooped the gong for Best Visual Effects for the BBC1 drama/documentary Hiroshima. POSTSCRIPT: As well as Doctor Who being nominated, The Model Unit, run by Mike Tucker, is also in line for an award for its visual effects work on Krakatoa: The Last Days, while Neill Gorton is nominated, alongside Vanessa White, for make-up and hair design on The Catherine Tate Show. The ratings for the Friday night repeats of Series Two came to a peak last week with the climax of the series, Doomsday, being watched by half a million people. This was enough to make Doctor Who the fourth most watched programme on Multi Channel Television for the day. Overall the series averaged 330,000 viewers throughout its run.